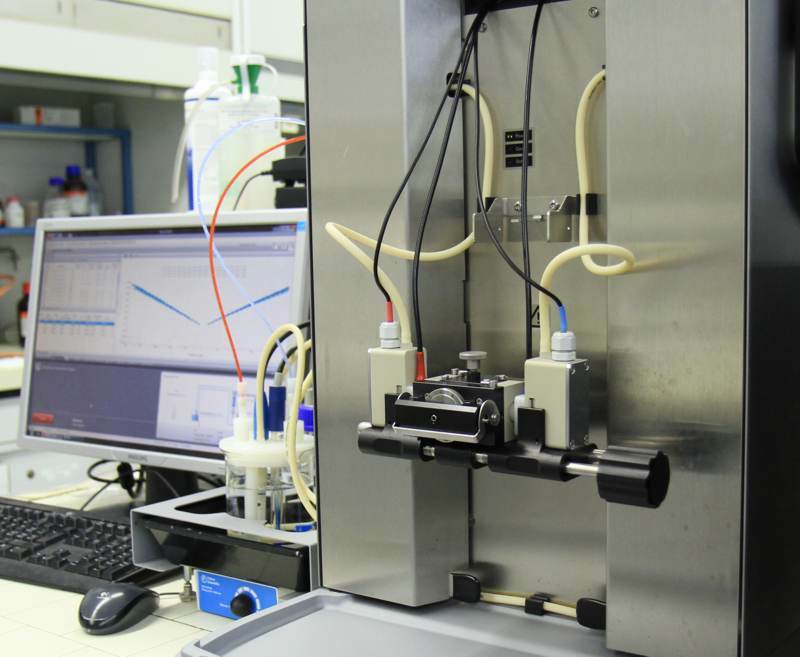 Since our research is strongly experimentally oriented, we maintain a substantial instrumental park in our laboratory. These instruments can be classified in three main groups, namely light scattering, atomic force microscopy, and surface sensitive techniques. We also operate various standard laboratory equipment, such as, refractometers, viscometers, titrators, pH sensors, conductivity meters, or water purification systems. Several light scattering instruments are being operated, most of them from the ALV company. The multi-angle goniometer shown on the photo to the right is the most sophisticated one. 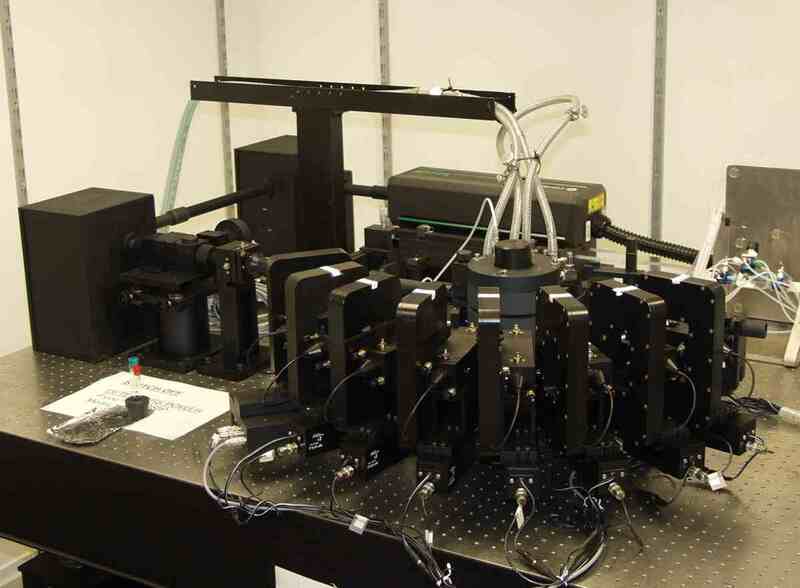 The system is mounted on an optical table, and uses a solid state laser operating at a wavelength of 532 nm as a light source. The light beam is additionally polarized and focused on the sample, which is inserted in a cuvette in an index matching bath filled with toluene. This setting minimized reflections from the glass walls. The scattered light is collected with 8 detectors separated by 17° mounted on a goniometer. Each detector picks up the scattered light with a multi-mode fiber and is converted with a photomultiplier to a series of single-photon pulses. These pulses are analyzed with a correlator, which yields the corresponding auto-correlation function, as well as the overall scattering intensity for all 8 detectors. Therefore, the instrument permits to carry out static and dynamic light scattering simultaneously at different angles. This option is essential when such measurements are required in a time resolved fashion. The detector at the largest scattering angle incorporates a beam-splitter and two photomutipliers. Optionally, the goniometer can be operated at a single angle but in pseudo cross-correlation detection. This mode eliminates the after-pulsing of the photomutipliers, and thus can be used to measure fast correlation times. The multi-angle instrument did also substantially boost the accuracy of the hydrodynamic layer thickness measurements of adsorbed polyelectrolyte films on oppositely charged colloidal particles [L4]. Another useful instrument is the compact goniometer system, see photo on the right. 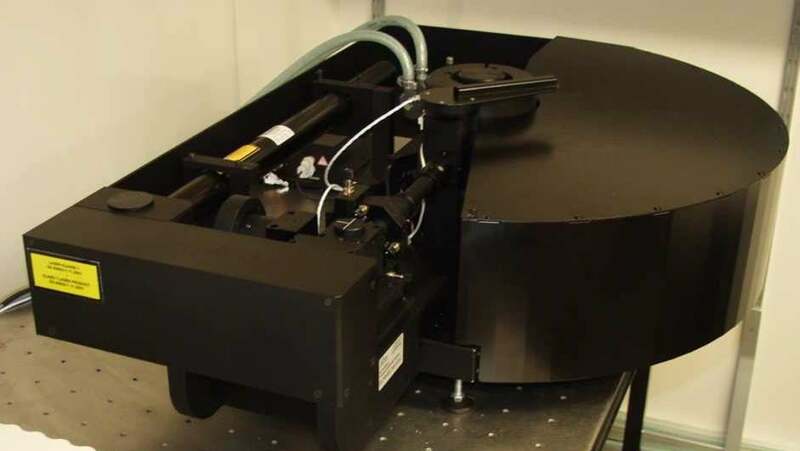 The goniometer has the advantage that it operates a small helium-neon laser at 633 nm and thus can be placed on any bench top. The system also features an index matching bath and movable arm with an avalanche photodiode detector. The advantage of this detector is that it has a much better efficiency than a photomultiplier, and thus a low power laser is sufficient to get good count rates. This system is routinely used to measure form factors in stable suspensions, hydrodynamic layer thickness [L4], or stability ratios in aggregation processes [L1,L5]. Back scattering instruments are the other type of light scattering instruments used. They operate at a single and fixed scattering angle of 173°. The advantages of these instruments are numerous. They are highly sensitive due to the large scattering volume, the sample can be simply introduced in a spectrophotometric cuvette, and that turbid samples can be investigated as well. The disadvantage is of course that information can be only obtained at a single scattering angle. These instruments has equally being used to measure the hydrodynamic layer thickness [L4] or stability ratios in aggregation processes [L1]. The instrument shown on the photo above was still distributed by the ALV company, but the technology was later sold to Malvern. 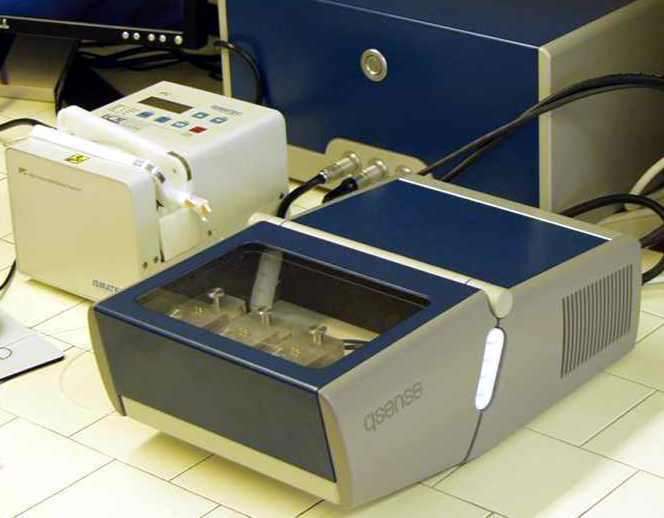 The latter company developed a combined instrument capable to measure back scattering and electrophoretic measurements. This instrument is equally used in our laboratory. From the electrophoretic mobility, the electrokinetic potential (ζ-potential) of the particles can be obtained. [L1] Cao T., Szilagyi I., Oncsik T., Borkovec M., Trefalt G. (2015) Aggregation of colloidal particles in the presence of multivalent coions: The inverse Schulze-Hardy rule, Langmuir, 31, 6610-6614, 10.1021/acs.langmuir.5b01649. [L2] Galletto P., Lin W., Borkovec M. (2005) Measurement of heteroaggregation rate constants by simultaneous static and dynamic light scattering, Phys. Chem. Chem. Phys. 7, 1464-1471 10.1039/b417761d. [L3] Lin W., Kobayashi M., Skarba M., Mu C., Galletto P., Borkovec M. (2006) Heteroaggregation in binary mixtures of oppositely charged colloidal particles, Langmuir, 22, 1038-1047, 10.1021/la0522808. [L4] Hierrezuelo J., Szilagyi I., Vaccaro A., Borkovec M. (2010) Probing nanometer-thick polyelectrolyte layers adsorbed on oppositely charged particles by dynamic light scattering, Macromolecules 2010, 43, 9108-9116, 10.1021/ma1014462. [L5] Oncsik T., Trefalt G., Borkovec M., Szilagyi I. (2015) Specific ion effects on particle aggregation induced by monovalent salts within the Hofmeister series, Langmuir, 31, 3799-3807, 10.1021/acs.langmuir.5b00225. 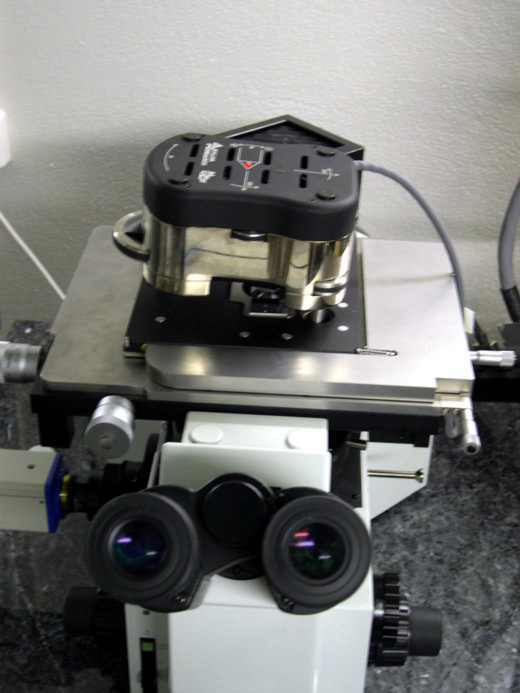 The atomic force microscope (AFM) is an essential tool to characterize the structure of surfaces as well as to measure surface forces with the colloidal probe technique. Several of our AFMs were obtained from Asylum Research. The most important instrument is the molecular force probe (MFP) shown on the right photo. This instrument consists of a head, which includes a vertical scanner and the cantilever detection optics. The horizontal scanner can be inserted below. 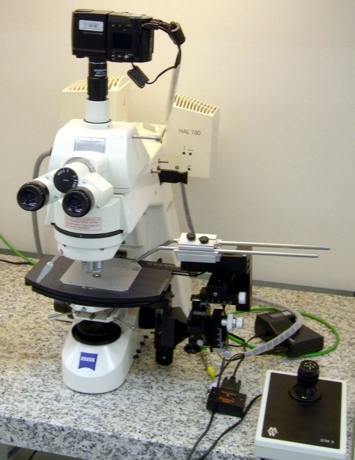 The whole instrument is installed on the table of an optical inverted microscope. The sample can be investigated in a flow-through cell. This setup has the advantage that the sample can be observed with the optical microscope during an AFM scan. Silica particles were also glued to cantilevers and to substrates with the micromanipulator shown on the left. 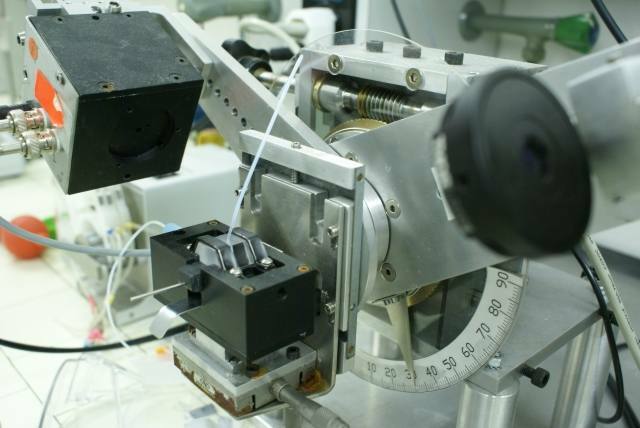 The micromanipulator is installed in a clean room to avoid surface contamination of the particles. In this fashion, forces between silica particles and planar substrates or different silica particles could be investigated [A3]. While several other AFMs are available in our laboratory for imaging, the Cypher-AFM is the most sophisticated one. AFM imaging is mainly carried out to investigate the surface structure of substrates or of colloidal particles as well as to obtain images of adsorbed macromolecules. Numerous studies were carried out concerning the organization of adsorbed dendrimers [A6] or of linear polyelectrolytes [A7]. [A1] Borkovec M., Szilagyi I., Popa I., Finessi M., Sinha P., Maroni P., Papastavrou G. (2012) Investigating forces between charged particles in the presence of oppositely charged polyelectrolytes with the multi-particle colloidal probe technique, Adv. Colloid Interf. Sci. (in press), 10.1016/j.cis.2012.06.005,. [A2] Popa I., Sinha P., Finessi M., Maroni P., Borkovec M. (2010) Importance of charge regulation in attractive double-layer forces between dissimilar surfaces, Phys. Rev. Lett, 104, 228301, 10.1103/PhysRevLett.104.228301. [A3] Rentsch S., Pericet-Camara R., Papastavrou G., Borkovec M. (2006) Probing the validity of the Derjaguin approximation for heterogeneous colloidal particles, Phys. Chem. Chem. Phys., 8, 2531-2538, 10.1039/b602145j. [A4] Grebikova L., Maroni P., Zhang B. Z., Schluter D. A., Borkovec M. (2014) Single molecule force measurements by nano-handling of individual dendronized polymers, ACS Nano 8, 2237-2245, 10.1021/nn405485h (open access). [A5] Radtchenko I. L., Papastavrou G., Borkovec M. (2005) Direct force measurements between cellulose surfaces and colloidal silica particles, Biomacromolecules, 6, 3057-3066, 10.1021/bm050371d. [A7] Muresan L., Maroni P., Popa I., Porus M., Longtin R., Papastavrou G., Borkovec M. (2011) Conformational changes of polyamidoamine (PAMAM) dendrimers adsorbed on silica substrates, Macromolecules 44, 5069-5071, 10.1021/ma201103n. [A8] Kirwan L. J., Papastavrou G., Borkovec M., Behrens S. H. (2004) Imaging the coil-to-globule conformational transition of a weak polyelectrolyte by tuning the polyelectrolyte charge density, Nano Lett. 4, 149-152, 10.1021/nl034912l. Various techniques are being used to analyze surfaces and adsorbed thin films. 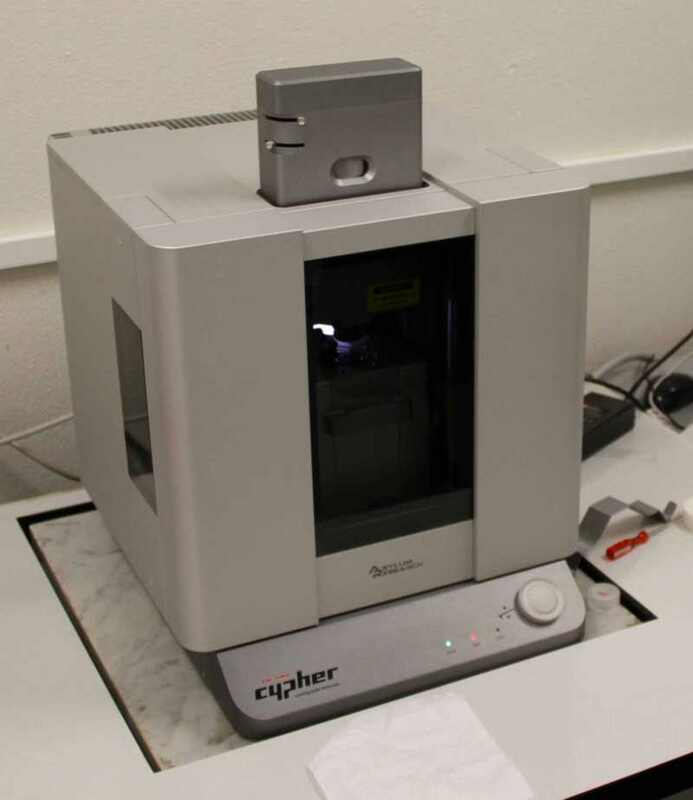 A scanning angle ellipsometer is available to investigate thin films on surfaces. The ellipsometer is shown on the right and consists of two rotating arms. One of them carries a laser as a light source. 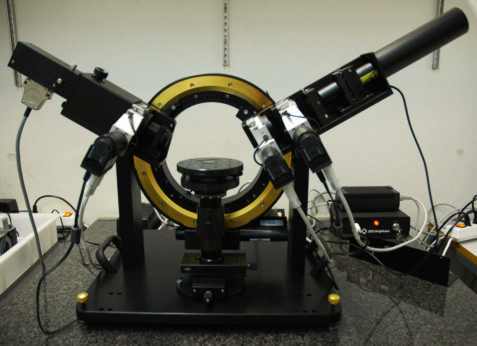 The light beam passes through a rotating polarizer, then a compensator, and is focused on the horizontal sample. The reflected beam passes an analyzer and its intensity is measured by a photodiode. 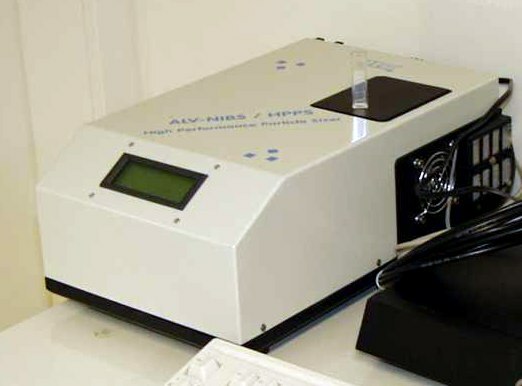 The instrument can be used as a null-ellipsometer or to measure surface plasmon resonances [S1]. Another important application is the characterization of thin surface films (e.g., silica, cellulose) [S2, S3]. For sufficiently thick films, the refractive index as well as the thickness of the surface film can be determined. For thinner films, only one of these quantities is accessible. Reflectometry is the most popular technique to study adsorption and deposition processes in our laboratory. Such instruments are made in our departmental workshops. As shown in the photo on the left, such an instrument consists of two rotating arms. The laser beam passes through an polarizer and a compensator, and is focused onto the surface to be investigated. The reflected beam passes through a beam splitter, and is detected by two photodiodes. The reflectometry signal is obtained from the ratio of the two photodiode currents, it is directly proportional to the adsorbed mass for thin films. The system features a flow through cell in the impinging jet flow geometry. This technique is most versatile to study a wide range of adsorption processes, and we have been using it extensively to study adsorption of polyelectrolytes or deposition of particles [S2, S3]. Recently, highly sensitive variant of this techniques was proposed capable to study the adsorption of simple ions [S4]. Another interesting application of QCM is its combination with reflectivity. By combining the wet mass obtained from QCM and the dry mass from reflectivity, the water content and the film thickness can be elucidated even for very thin films [S3]. The surface charge of planar water-solid interfaces are being studied with streaming potential techniques. A flowing electrolyte solution past a charged interface induces an drop in the electric potential along the flow, which is also accompanied by an electric current. This potential drop is referred as the streaming potential, while the induced electric current as the streaming current. From these quantities the electrokinetic potential (ζ-potential) of the surface can be evaluated. We have two instruments at our disposal. The first instrument from Anton Paar is shown on the left and uses a parallel flow cell. The second instrument is shown on the right and uses a rotating disk. This geometry is more useful for kinetic studies as it leads to a more uniform deposition rate over the substrate. For more information on this technique, see here. [S1] Porus M., Maroni P., Bhosale R., Sakai N., Matile S., Borkovec M. (2011) Zipper and layer-by-layer assemblies of artificial photosystems analyzed by combining optical and piezoelectric surface techniques, Langmuir 27, 7213-7221, 10.1021/la2007815 . [S2] Kleimann J., Lecoultre G., Papastavrou G., Jeanneret S., Galletto P., Koper G. J. M., Borkovec M. (2006) Deposition of nanosized latex particles onto silica and cellulose surfaces studied by optical reflectometry, J. Colloid Interf. Sci. 303, 460-471, 10.1016/j.jcis.2006.08.006. [S3] Porus M., Maroni P., Borkovec M. (2012) Structure of adsorbed polyelectrolyte monolayers investigated by combining optical reflectometry and piezoelectric techniques, Langmuir 28, 5642-5651, 10.1021/la204855j. [S5] Porus M., Clerc F., Maroni P., Borkovec M. (2012) Ion-specific responsiveness of polyamidoamine (PAMAM) dendrimers adsorbed on silica substrates, Macromolecules 2012, 45, 3919-3927, 10.1021/ma3004295. October 3, 2013, 11:47. Depends on the contrast, but one typically needs films thicker than 20 nm to separate the refractive index and the thickness. October 3, 2013, 9:13. What is the thickness of adsorbed films such that one can separate the refractive index and the layer thickness with ellipsometry?